Cayo Arena, off the Dominican Republic’s northern coast, is a faint whisper of a Caribbean island that barely even exists. This sandy dollop rising up from the reef measures 2,100 square feet—which makes it less than a tenth of an acre of fine, sparkling white sand. After racing across the cobalt sea in a speedboat from Punta Rucia, arrive on the fringes of the coral reef that surrounds the patch of sand. The island itself is undeveloped—save for some thatched roof huts—and snorkeling in the calm, turquoise lagoon is a way to literally come face to face with curious Caribbean fish. Also known as “Paradise Island,” Cayo Arena is truly a place that’s out of a tropical dream, where sand, sky, and crystal clear water combine to create a Caribbean outpost that seems too beautiful to be real. Cayo Arena is a 20-minute boat ride from the beach at Punta Rucia, which itself is located an hour and half to the west of Puerto Plata. 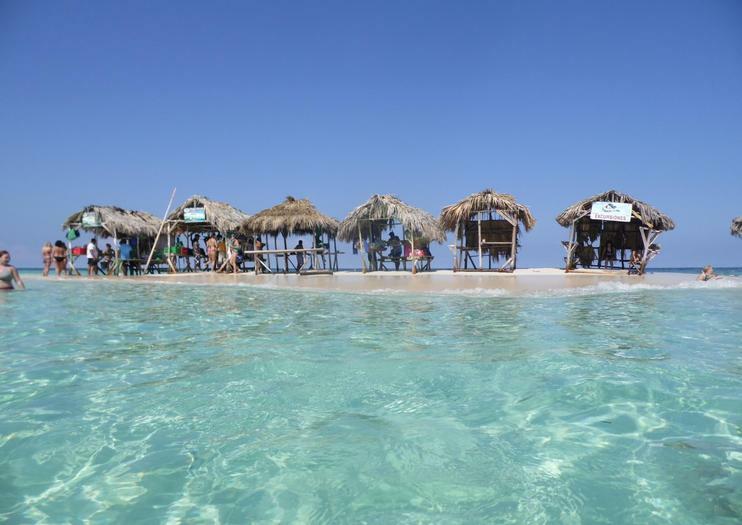 The cay is accessible by guided tours, many of which also visit the mangroves that line Punta Rucia’s shore. As there’s no shade on Cayo Arena, be sure to pack sunscreen, a hat, or a coverup if you want to escape the sun.